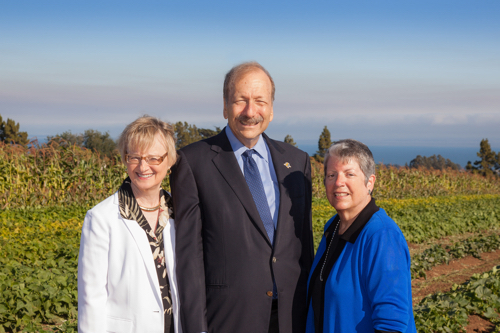 UC President Janet Napolitano, right, Chancellor George Blumenthal, and his wife, Kelly Weisberg. UC President Janet Napolitano issued a statement after Chancellor George Blumenthal announced his plan to retire at the end of the coming academic year. “UC Santa Cruz Chancellor George Blumenthal, whose exceptional career at the University of California has spanned more than 46 years, has informed me that he will retire at the close of the current academic year. While I wish him the very best, I want to acknowledge this news as bittersweet for the Santa Cruz campus, the larger UC community and for me, personally. Chancellor Blumenthal has led the Santa Cruz campus for more than 12 years with an unstinting passion for the university’s public mission and core values. As UC Santa Cruz’s 10th chancellor, he has greatly expanded opportunities and access for underrepresented and low-income students and increased both the size and the academic scope of the campus. He arrived in Santa Cruz in 1972 as a faculty member in astronomy and astrophysics and served for many years as a distinguished professor, researcher and campus leader. He has also served the university on a systemwide level as chair of the UC Academic Senate and faculty representative to the UC Board of Regents. The list of George’s accomplishments, far too numerous to list here, is a testament to his devotion to a life of learning, teaching and public service. In all his endeavors at the university, he has demonstrated his sharp intellect, deep engagement, curiosity and wit. In the coming weeks, I intend to convene a committee to conduct a national search to find a new chancellor for the dynamic and beautiful Santa Cruz campus, which deserves and demands the best leadership possible.